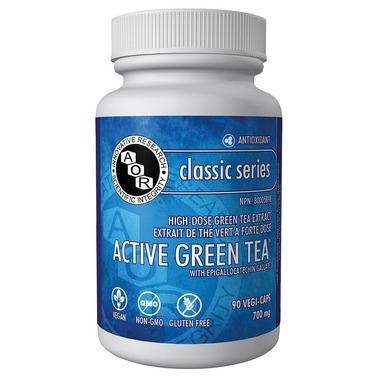 AOR Active Green Tea is a high-potency standardized extract of green tea, high in epigallocatechin gallate (EgCG), believed to be the key phytonutrient in green tea, responsible for its health benefits. Studies most consistently report health benefits in persons drinking 10 cups a day of high-EgCG sencha-style Japanese Green Tea; each cup of this tea contains 150 milligrams of EgCG. The labels of most green tea extracts exaggerate the number of cups of tea represented in their capsules by comparing the product to poor-quality teas. AOR’s Active Green Tea allows you to more fully enjoy the healthy properties of a Sencha-rich lifestyle without consuming large volumes of tea. Adult Dosage: To equate the EgCG consumption of the best Japanese studies, take 1 capsule three times daily with food, or as directed by a qualified health care practitioner. Non-medicinal ingredients: ascorbyl palmitate. Capsule: hypromellose. I know I can trust this brand! I trust this company for its superior quality! Best decaf high potency green tea supplement with 50% EGCG that I could find. I give this to my son (for health reasons) so I need to open a capsule and put it in food. With this potency I only need one capsule, and itâ€™s SO MUCH EASIER to disguise the taste.